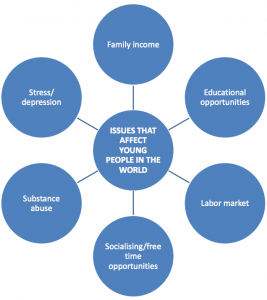 1 M9: Issues that affect young people in the world... the most affecting one is where you live and how much fa- money your family gets. If they don't get enough money you may... end up not getting enough food and starving or if you get a lot of money you can get a lot of things that could... potentially make you happier in life... What do you think about that? 4 M10: won't be able to go to school. 7 M9: So that takes us to educational opportunities. 16 M10: uniform, the food... so you need to pay a lot of things. 18 M10: //Yeah you probably won't be able// to survive. 19 M9: Yeah you can't afford of college there... that's not a good thing. 20 M10: It's not a good thing as you already said. 26 M10: you know. 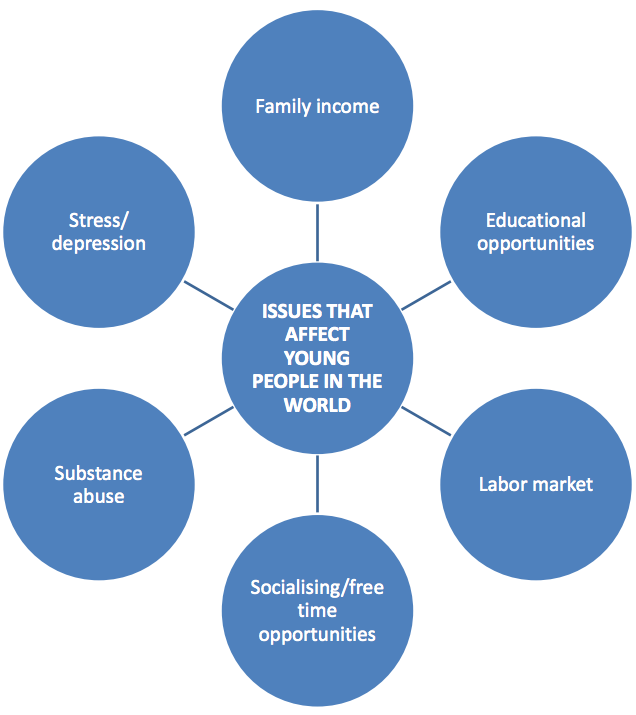 Not just the young people but I don't know what is the cause of this kind of problem to the young people even though they haven't experienced that much of things in their life. 27 M9: Yeah well I have known one girl... that was depressed and she ended up killing herself... so... that's a pretty bad thing because if you don't help early enough... it may end up pretty badly. 29 M9: Do you wanna choose a topic? 32 M10: If you want. 34 M10: Is it my turn? 36 M10: Mmm... educational opportunities is one of the rarest thing that you know young people can get in their life and er it will- you know it- it helps quite a lot of things to be educated person... because you can get you know good job you can have a good family you can- you can live you know pretty much happy life as you just subscribed earlier, which just makes education you know very [inaudible] that every single person in this world should have the opportunity to get education in their life. 39 M9: or the expensive countries where the people just cannot afford to go to school. 40 M10: Yeah no- not everyone can afford getting education. 42 M10: Even though it's po- so important but it's just how life is, isn't it? 43 M9: Yeah. And if you cannot get education you probably are not getting a job, too... and that may lead just to depression or stress. 48 M10: So I think they are related to each other. 51 M9: Then again if you don't get a job you become depressed... you start using alcohol a little too much and that may end up badly too. 52 M10: And that might even... you know cause a stress or depression as you just mentioned //earlier//. 55 M9: Well... let's talk about substance abuse because we let's- started talking about alcohol... because people, nowadays, start drinking and using drugs quite early... under eighteen years old... and what do you think about? 56 M10: I think that's also another problem that young people need not to do because it just doesn't make their lives go wrong but it- it might also end up there you know... you know affecting their friends' lives and close friends' you know close families and so on you know not only... it's not- it's not only you know bad for themselves but also for you know all those close people that you know are close to them so it might affect them as well. 58 M10: //Yeah in the// end it just leads to depression. 59 M9: Yeah. And there's really nothing good about it either... so you just hurt you and it may kill you in a bad situation.